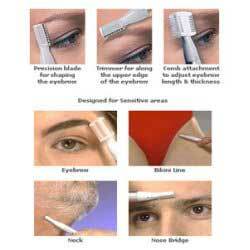 Micro-Trim shaping your eyebrows to the way you want is a breeze. Adjust brow length and style using the three multipurpose shaping combs. Safety design glides the hypoallergenic blade over your skin. Forget bulky shavers. The super compact Micro-Trim is the size of a mascara pen! Pop it right in your purse for on-the-go convenience. So discreet it fits in even the smallest makeup bag. No razor gives you such comfortable, smooth results on your neck, bridge of your nose, and upper lip. Micro-Trim comes with an extra attachment that allows you to trim eyebrows to the length you want.